It’s amazing to me how a song lyric can capture ones feeling better than one is able to express it. 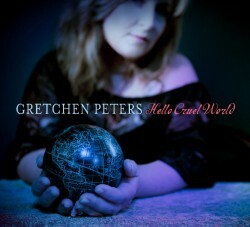 I love this title track from Gretchen Peters new album. It’s a breath of hope and an admission that despite the hardships that life might deal, she is facing it on her own terms. This album feels like a continuation, or the next chapter after her 2007 album Burnt Toast & Offerings, which is also a fantastic album. Woman On The Wheel is another song on this album not to miss. I won’t spoil the punchline for you by posting it here. You will have to go listen to it yourself. Other favorite songs from this album: Saint Francis, The Matador, Dark Angel, Paradise Found…okay, I pretty much like them all. Another thing I like about Gretchen’s song are that they can be listened to on a deep level. There is plenty their to consume and process. But the songs are also wonderful as background music, when you just need something going in your ears. My only regret is that I can’t buy this album on vinyl. Gretchen, allmusic.com lists you as a country singer. I would never call myself a “Country Western” fan. But if what you sing is country then, almost thou persuadest me to like country. Regardless…welcome back to my iPod. Hello again Gretchen. I believe it is worthwhile trying to discover more about the world, even if this only teaches us how little we know. It might do us good to remember from time to time that, while differing widely in the various little bits we know, in our infinite ignorance we are all equal.